Dezeen features our latest residential project in Melbourne, Casa Atrio. 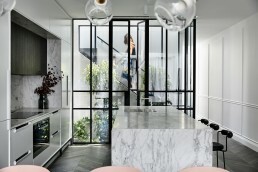 [Extract] Biasol has designed the interior of this Melbourne home to evoke a classic Parisian apartment, placing a plant-filled light well at its centre. Casa Atrio is a narrow terrace house in the neighbourhood of Carlton, and has been overhauled to feature a sequence of bright, white-painted living spaces with decadent details. At the centre of the home lies a black-framed atrium filled with greenery, illuminating the formally light-starved ground level. Chevron-shaped wooden floors run throughout. French-style wall panelling has then been applied to the long corridor that leads from the front door to the rear living area, which looks out to a small courtyard through full-height glazed doors.